I am starting to have a real backlog of posts. I am planning to put up posts on my next Napoleonic army (someone did guess correctly on my second last post), some comparison photos of Bronze Age and Gripping Beast Vikings (as requested), my son's LotR collection (which I have started to revitalize), my Dux Britainniarum Saxon Army (well actually my Vikings with some new command figures and movement trays) as well as some photos of my first painted Napoleonic figures (done almost 40 years ago) which I have just dug up. I have been doing a lot of day shifts recently and unfortunately, where the days are short, this leaves no time for photography in natural light. In the interim though, I thought I would direct you to a couple of other blogs which document a recent game we had in Montreal. It was a great game and although it ended up being called a draw, we had a wonderful time. It is also the first time I had played with an umpire, which was really fun. Generally, we are playing rules that with which we have a passing familiarity. This usually requires constant referral to the rule book as well as some good natured debate over points of play. This is OK but does distract from playing the game. 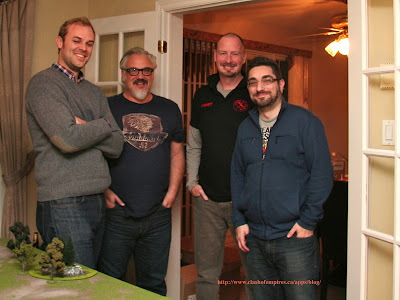 Curt of Analogue Hobbies made a much heralded trip to Montreal to debut his personally designed set of Napoleonic rules. I am sure within the next month or two we will hear more about them on his blog, but suffice to say that these rules have relatively simple mechanisms of combat but a depth of detail that should satisfy most Napoleonic gamers. I will leave it up to Curt to detail them, but I would like to say that there is an overall requirement of documentation of Strategy with excellent Initiative Command system; this is followed by a simple system of movement and elegant 2 step firing and melee mechanisms. The game is played at the tactical level and each unit has a detailed number of attributes. Curt also has some playing aids that really make the game look great on the table. I should really stop there, but I should say that our small group so enjoyed them, that we plan to continue to trial them in our next Napoleonic game. Anyway Curt has a brief AAR on his blog and Iannick has many photos on Clash of Empires. Anyway here we all are after the game, I believe we all look pretty cheerful! From left to right: Nicolas, myself, Curt and Iannick. Missing from our group was Iannick's brother Gabriel who unfortunately could not play that day. I am off the weekend so hopefully I will get some photos done and some more posts up. I saw the report on Curt's blog, it looked like a great game! Nicolas looks familiar to me. Was he from Paris (or the area) originally? Thanks for the favourable plug on the rules, John. (The fiver's in the mail...) It was a great day out with a fabulous bunch of guys. I very much look forward to our next get-together! Sweet picture, although I look as blind as on Iannick's Clash of Empire. A Moria last stand? I'd like to read about that!